Cast alumnimum used as a replacement for cast iron. Photo: NPS files. The Secretary of the Interior's Standards for Rehabilitation require that "deteriorated architectural features be repaired rather than replaced, wherever possible. In the event that replacement is necessary, the new material should match the material being replaced in composition, design, color, texture, and other visual properties." Substitute materials should be used only on a limited basis and only when they will match the appearance and general properties of the historic material and will not damage the historic resource. When deteriorated, damaged, or lost features of a historic building need repair or replacement, it is almost always best to use historic materials. In limited circumstances substitute materials that imitate historic materials may be used if the appearance and properties of the historic materials can be matched closely and no damage to the remaining historic fabric will result. Great care must be taken if substitute materials are used on the exteriors of historic buildings. Ultraviolet light, moisture penetration behind joints, and stresses caused by changing temperatures can greatly impair the performance of substitute materials over time. Only after consideration of all options, in consultation with qualified professionals, experienced fabricators and contractors, and development of carefully written specifications should this work be undertaken. 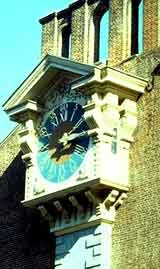 In the reconstruction of the clock tower at Independence Hall, the substitute materials used were cast stone and wood with fiberglass and polyester bronze ornamentation. Photo: NPS files. The practice of using substitute materials in architecture is not new, yet it continues to pose practical problems and to raise philosophical questions. On the practical level the inappropriate choice or improper installation of substitute materials can cause a radical change in a building's appearance and can cause extensive physical damage over time. On the more philosophical level, the wholesale use of substitute materials can raise questions concerning the integrity of historic buildings largely comprised of new materials. In both cases the integrity of the historic resource can be destroyed. Some preservationists advocate that substitute materials should be avoided in all but the most limited cases. The fact is, however, that substitute materials are being used more frequently than ever in preservation projects, and in many cases with positive results. They can be cost-effective, can permit the accurate visual duplication of historic materials, and last a reasonable time. Growing evidence indicates that with proper planning, careful specifications and supervision, substitute materials can be used successfully in the process of restoring the visual appearance of historic resources. This Brief provides general guidance on the use of substitute materials on the exteriors of historic buildings. While substitute materials are frequently used on interiors, these applications are not subject to weathering and moisture penetration, and will not be discussed in this Brief. Given the general nature of this publication, specifications for substitute materials are not provided. The guidance provided should not be used in place of consultations with qualified professionals. This Brief includes a discussion of when to use substitute materials, cautions regarding their expected performance, and descriptions of several substitute materials, their advantages and disadvantages. This review of materials is by no means comprehensive, and attitudes and findings will change as technology develops. The tradition of using cheaper and more common materials in imitation of more expensive and less available materials is a long one. George Washington, for example, used wood painted with sand-impregnated paint at Mount Vernon to imitate cut ashlar stone. This technique along with scoring stucco into block patterns was fairly common in colonial America to imitate stone. Molded or cast masonry substitutes, such as dry-tamp cast stone and poured concrete, became popular in place of quarried stone during the 19th century. These masonry units were fabricated locally, avoiding expensive quarrying and shipping costs, and were versatile in representing either ornately carved blocks, plain wall stones or rough cut textured surfaces. The end result depended on the type of patterned or textured mold used and was particularly popular in conjunction with mail order houses. Later, panels of cementitious permastone or formstone and less expensive asphalt and sheet metal panels were used to imitate brick or stone. Substitute materials need to be located with care to avoid damage. 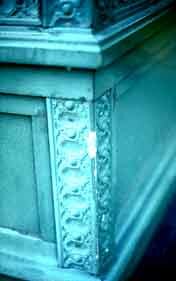 The fiberglass column base has chipped, whereas the historic cast iron would have remained sound. Photo: NPS files. Metal (cast, stamped, or brake-formed) was used for storefronts, canopies, railings, and other features, such as galvanized metal cornices substituting for wood or stone, stamped metal panels for Spanish clay roofing tiles, and cast-iron column capitals and even entire building fronts in imitation of building stone. Terra-cotta, a molded fired clay product, was itself a substitute material and was very popular in the late 19th and early 20th centuries. It simulated the appearance of intricately carved stonework, which was expensive and time-consuming to produce. Terra cotta could be glazed to imitate a variety of natural stones, from brownstones to limestones, or could be colored for a polychrome effect. Nineteenth century technology made a variety of materials readily available that not only were able to imitate more expensive materials but were also cheaper to fabricate and easier to use. Throughout the century, imitative materials continued to evolve. For example, ornamental window hoods were originally made of wood or carved stone. In an effort to find a cheaper substitute for carved stone and to speed fabrication time, cast stone, an early form of concrete, or cast-iron hoods often replaced stone. Toward the end of the century, even less expensive sheet metal hoods, imitating stone, also came into widespread use. All of these materials, stone, cast stone, cast iron, and various pressed metals were in production at the same time and were selected on the basis on the basis of the availability of materials and local craftsmanship, as well as durability and cost. The criteria for selection today are not much different. Many of the materials used historically to imitate other materials are still available. These are often referred to as the traditional materials: wood, cast stone, concrete, terra cotta and cast metals. In the last few decades, however, and partly as a result of the historic preservation movement, new families of synthetic materials, such as fiberglass, acrylic polymers, and epoxy resins, have been developed and are being used as substitute materials in construction. In some respects these newer products (often referred to as high tech materials) show great promise; in others, they are less satisfactory, since they are often difficult to integrate physically with the porous historic materials and may be too new to have established solid performance records. Because the overzealous use of substitute materials can greatly impair the historic character of a historic structure, all preservation options should be explored thoroughly before substitute materials are used. It is important to remember that the purpose of repairing damaged features and of replacing lost and irreparably damaged ones is both to match visually what was there and to cause no further deterioration. For these reasons it is not appropriate to cover up historic materials with synthetic materials that will alter the appearance, proportions and details of a historic building and that will conceal future deterioration. Some materials have been used successfully for the repair of damaged features such as epoxies for wood infilling, cementitious patching for sandstone repairs, or plastic stone for masonry repairs. Repairs are preferable to replacement whether or not the repairs are in kind or with a synthetic substitute material. code-required changes (which in many cases can be extremely destructive of historic resources). The core of a deteriorated wood outrigger was first drilled out. Photos (left and right): Courtesy, Harrison Goodall. An inert material was injected into the hollow outrigger, permitting the outer wood to be retained and preserved. Cost may or may not be a determining factor in considering the use of substitute materials. Depending on the area of the country, the amount of material needed, and the projected life of less durable substitute materials, it may be cheaper in the long run to use the original material, even though it may be harder to find. Due to many early failures of substitute materials, some preservationist are looking abroad to find materials (especially stone) that match the historic materials in an effort to restore historic buildings accurately and to avoid many of the uncertainties that come with the use of substitute materials. 1. The unavailability of the historic material. The most common reason for considering substitute materials is the difficulty in finding a good match for the historic material (particularly a problem for masonry materials where the color and texture are derived from the material itself). This may be due to the actual unavailability of the material or to protracted delivery dates. For example, the local quarry that supplied the sandstone for a building may no longer be in operation. All efforts should be made to locate another quarry that could supply a satisfactory match. If this approach fails, substitute materials such as dry-tamp cast stone or textured precast concrete may be a suitable substitute if care is taken to ensure that the detail, color and texture of the original stone are matched. In some cases, it may be possible to use a sand-impregnated paint on wood as a replacement section, achieved using readily available traditional materials, conventional tools and work skills. Simple solutions should not be overlooked. 2. The unavailability of historic craft techniques and lack of skilled artisans. These two reasons complicate any preservation or rehabilitation project. This is particularly true for intricate ornamental work, such as carved wood, carved stone, wrought iron, cast iron, or molded terra cotta. However, a number of stone and wood cutters now employ sophisticated carving machines, some even computerized. It is also possible to cast substitute replacement pieces using aluminum, cast stone, fiberglass, polymer concretes, glass fiber reinforced concretes and terra cotta. Mold making and casting takes skill and craftsmen who can undertake this work are available. Efforts should always be made, prior to replacement, to seek out artisans who might be able to repair ornamental elements and thereby save the historic features in place. Cast aluminum has been used as a replacement material for cast iron. Photo: NPS files. 3. Poor original building materials. Some historic building materials were of inherently poor quality or their modern counterparts are inferior. In addition, some materials were naturally incompatible with other materials on the building, causing staining or galvanic corrosion. Examples of poor quality materials were the very soft sandstones which eroded quickly. An example of poor quality modern replacement material is the tin coated steel roofing which is much less durable than the historic tin or terne iron which is no longer available. In some cases, more durable natural stones or precast concrete might be available as substitutes for the soft stones and modern terne-coated stainless steel or lead-coated copper might produce a more durable yet visually compatible replacement roofing. 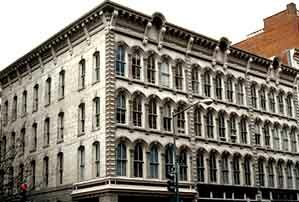 Sometimes referred to as life and safety codes, building codes often require changes to historic buildings. Many cities in earthquake zones, for example, have laws requiring that overhanging masonry parapets and cornices, or freestanding urns or finials be securely re-anchored to new structural frames or be removed completely. In some cases, it may be acceptable to replace these heavy historic elements with light replicas. In other cases, the extent of historic fabric removed may be so great as to diminish the integrity of the resource. This could affect the significance of the structure and jeopardize National Register status. In addition, removal of repairable historic materials could result in loss of Federal tax credits for rehabilitation. Department of the Interior regulations make clear that the Secretary of the Interior's Standards for Rehabilitation take precedence over other regulations and codes in determining whether a project is consistent with the historic character of the building undergoing rehabilitation. Two secondary reasons for considering the use of substitute materials are their lighter weight and for some materials, a reduced need of maintenance. These reasons can become important if there is a need to keep dead loads to a minimum or if the feature being replaced is relatively inaccessible for routine maintenance. In dealing with exterior features and materials, it must be remembered that moisture penetration, ultraviolet degradation, and differing thermal expansion and contraction rates of dissimilar materials make any repair or replacement problematic. To ensure that a repair or replacement will perform well over time, it is critical to understand fully the properties of both the original and the substitute materials, to install replacement materials correctly, to assess their impact on adjacent historic materials, and to have reasonable expectations of future performance. Many high tech materials are too new to have been tested thoroughly. The differences in vapor permeability between some synthetic materials and the historic materials have in some cases caused unexpected further deterioration. It is therefore difficult to recommend substitute materials if the historic materials are still available. As previously mentioned, consideration should always be given first to using traditional materials and methods of repair or replacement before accepting unproven techniques, materials or applications. 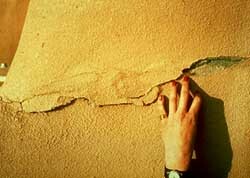 A waterproof coating is an inappropraite substitute material to apply to adobe as it seals in moisture and may result in spalling. Photo: NPS files. Substitute materials must meet three basic criteria before being considered: they must be compatible with the historic materials in appearance; their physical properties must be similar to those of the historic materials, or be installed in a manner that tolerates differences; and they must meet certain basic performance expectations over an extended period of time. In order to provide an appearance that is compatible with the historic material, the new material should match the details and craftsmanship of the original as well as the color, surface texture, surface reflectivity and finish of the original material. The closer an element is to the viewer, the more closely the material and craftsmanship must match the original. Matching the color and surface texture of the historic material with a substitute material is normally difficult. To enhance the chances of a good match, it is advisable to clean a portion of the building where new materials are to be used. If pigments are to be added to the substitute material, a specialist should determine the formulation of the mix, the natural aggregates and the types of pigments to be used. As all exposed material is subject to ultraviolet degradation, if possible, samples of the new materials made during the early planning phases should be tested or allowed to weather over several seasons to test for color stability. Fabricators should supply a sufficient number of samples to permit onsite comparison of color, texture, detailing, and other critical qualities. In situations where there are subtle variations in color and texture within the original materials, the substitute materials should be similarly varied so that they are not conspicuous by their uniformity. Substitute materials, notably the masonry ones, may be more water-absorbent than the historic material. If this is visually distracting, it may be appropriate to apply a protective vapor-permeable coating on the substitute material. However, these clear coatings tend to alter the reflectivity of the material, must be reapplied periodically, and may trap salts and moisture, which can in turn produce spalling. For these reasons, they are not recommended for use on historic materials. While substitute materials can closely match the appearance of historic ones, their physical properties may differ greatly. The chemical composition of the material (i.e., presence of acids, alkalines, salts, or metals) should be evaluated to ensure that the replacement materials will be compatible with the historic resource. Special care must therefore be taken to integrate and to anchor the new materials properly. The thermal expansion and contraction coefficients of each adjacent material must be within tolerable limits. The function of joints must be understood and detailed either to eliminate moisture penetration or to allow vapor permeability. Materials that will cause galvanic corrosion or other chemical reactions must be isolated from one another. To ensure proper attachment, surface preparation is critical. Deteriorated underlying material must be cleaned out. Noncorrosive anchoring devices or fasteners that are designed to carry the new material and to withstand wind, snow and other destructive elements should be used. Properly chosen fasteners allow attached materials to expand and contract at their own rates. Caulking, flexible sealants or expansion joints between the historic material and the substitute material can absorb slight differences of movement. 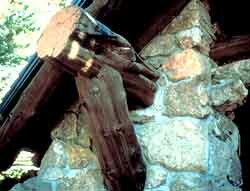 Since physical failures often result from poor anchorage or improper installation techniques, a structural engineer should be a member of any team undertaking major repairs. Some of the new high tech materials such as epoxies and polymers are much stronger than historic materials and generally impermeable to moisture. These differences can cause serious problems unless the new materials are modified to match the expansion and contraction properties of adjacent historic materials more closely, or unless the new materials are isolated from the historic ones altogether. When stronger or vapor impermeable new materials are used alongside historic ones, stresses from trapped moisture or differing expansion and contraction rates generally hasten deterioration of the weaker historic material. For this reason, a conservative approach to repair or replacement is recommended, one that uses more pliant materials rather than high-strength ones. Since it is almost impossible for substitute materials to match the properties of historic materials perfectly, the new system incorporating new and historic materials should be designed so that if material failures occur, they occur within the new material rather than the historic material. While a substitute material may appear to be acceptable at the time of installation, both its appearance and its performance may deteriorate rapidly. Some materials are so new that industry standards are not available, thus making it difficult to specify quality control in fabrication, or to predict maintenance requirements and long term performance. Where possible, projects involving substitute materials in similar circumstances should be examined. Material specifications outlining stability of color and texture; compressive or tensile strengths if appropriate; the acceptable range of thermal coefficients, and the durability of coatings and finishes should be included in the contract documents. Without these written documents, the owner may be left with little recourse if failure occurs. The historic cornice was successfully replaced with a fiberglass cornice. Photo: NPS files. The tight controls necessary to ensure long-term performance extend beyond having written performance standards and selecting materials that have a successful track record. It is important to select qualified fabricators and installers who know what they are doing and who can follow up if repairs are necessary. Installers and contractors unfamiliar with specific substitute materials and how they function in your local environmental conditions should be avoided. The surfaces of substitute materials may need special care once installed. For example, chemical residues or mold release agents should be removed completely prior to installation, since they attract pollutants and cause the replacement materials to appear dirtier than the adjacent historic materials. Furthermore, substitute materials may require more frequent cleaning, special cleaning products and protection from impact by hanging window-cleaning scaffolding. Finally, it is critical that the substitute materials be identified as part of the historical record of the building so that proper care and maintenance of all the building materials continue to ensure the life of the historic resource. Once all reasonable options for repair or replacement in kind have been exhausted, the choice among a wide variety of substitute materials currently on the market must be made. The charts at the end of this Brief describe a number of such materials, many of them in the family of modified concretes which are gaining greater use. The charts do not include wood, stamped metal, mineral fiber cement shingles and some other traditional imitative materials, since their properties and performance are better known. Nor do the charts include vinyls or molded urethanes which are sometimes used as cosmetic claddings or as substitutes for wooden millwork. Because millwork is still readily available, it should be replaced in kind. The charts describe the properties and uses of several materials finding greater use in historic preservation projects, and outline advantages and disadvantages of each. It should not be read as an endorsement of any of these materials, but serves as a reminder that numerous materials must be studied carefully before selecting the appropriate treatment. Included are three predominantly masonry materials (cast stone, precast concrete, and glass fiber reinforced concrete); two predominantly resinous materials (epoxy and glass fiber reinforced polymers also known as fiberglass), and cast aluminum which has been used as a substitute for various metals and woods. Material: Cast aluminum is a molten aluminum alloy cast in permanent (metal) molds or onetime sand molds which must be adjusted for shrinkage during the curing process. Color is from paint applied to primed aluminum or from a factory finished coating. Small sections can be bolted together to achieve intricate or sculptural details. Unit castings are also available for items such as column plinth blocks. Application: Cast aluminum can be a substitute for cast iron or other decorative elements. This would include grillwork, roof crestings, cornices, ornamental spandrels, storefront elements, columns, capitals, and column bases and plinth blocks. If not self-supporting, elements are generally screwed or bolted to a structural frame. As a result of galvanic corrosion problems with dissimilar metals, joint details are very important. Can existing be repaired or replaced inkind? How is cast aluminum to be with other metals attached? Have full-size details been developed for each piece to be cast? How are expansion joints detailed? Will there be a galvanic corrosion problem? have factory finishes been protected during installation? Material: Cast stone is an almost-dry cement, lime and aggregate mixture which is dry-tamped into a mold to produce a dense stone-like unit. Confusion arises in the building industry as many refer to high quality precast concrete as cast stone. In fact, while it is a form of precast concrete, the drytamp fabrication method produces an outer surface resembling a stone surface. The inner core can be either drytamped or poured full of concrete. 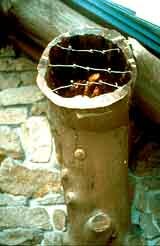 Reinforcing bars and anchorage devices can be installed during fabrication. Application: Cast stone is often the most visually similar material as a replacement for unveined deteriorated stone, such as brownstone or sandstone, or terra cotta in imitation of stone. It is used both for surface wall stones and for ornamental features such as window and door surrounds, voussoirs, brackets and hoods. Rubberlike molds can be taken of good stones on site or made up at the factory from shop drawings. Are the original or similar materials available? How are units to be installed and anchored? Have performance standards been developed to ensure color stability? Have large samples been delivered to site for color, finish and absorption testing? Has mortar been matched to adjacent historic mortar to achieve a good color/tooling match? Material: Glass fiber reinforced concretes are lightweight concrete compounds modified with additives and reinforced with glass fibers. They are generally fabricated as thin shelled panels and applied to a separate structural frame or anchorage system. The GFRC is most commonly sprayed into forms although it can be poured. The glass must be alkaline resistant to avoid deteriorating effects caused by the cement mix. The color is derived from the natural aggregates and if necessary a small percentage of added pigments. Application: Glass fiber reinforced concretes are used in place of features originally made of stone, terra cotta, metal or wood, such as cornices, projecting window and door trims, brackets, finials, or wall murals. As a molded product it can be produced in long sections of repetitive designs or as sculptural elements. Because of its low shrinkage, it can be produced from molds taken directly from the building. It is installed with a separate noncorrosive anchorage system. As a predominantly cementitious material, it is vapor permeable. Are the original materials and craftsmanship still available? Have samples been inspected on the site to ensure detail/texture match? Has anchorage system been properly designed? Have performance standards been developed? Material: Precast concrete is a wet mix of cement and aggregate poured into molds to create masonry units. Molds can be made from existing good surfaces on the building. Color is generally integral to the mix as a natural coloration of the sand or aggregate, or as a small percentage of pigment. To avoid unsightly air bubbles that result from the natural curing process, great care must be taken in the initial and longterm vibration of the mix. Because of its weight it is generally used to reproduce individual units of masonry and not thin shell panels. Application: Precast concrete is generally used in place of masonry materials such as stone or terra cotta. It is used both for flat wall surfaces and for textured or ornamental elements. This includes wall stones, window and door surrounds, stair treads, paving pieces, parapets, urns, balusters and other decorative elements. It differs from cast stone in that the surface is more dependent on the textured mold than the hand tamping method of fabrication. Is the historic material still available? What are the structural/anchorage requirements? Have samples been matched for color/texture/absorption? Have shop drawings been made for each shape? Has mortar been matched to adjacent historic mortar to achieve good color/tooling match? Material: Fiberglass is the most well known of the FRP products generally produced as a thin rigid laminate shell formed by pouring a polyester or epoxy resin gelcoat into a mold. When tack-free, layers of chopped glass or glass fabric are added along with additional resins. Reinforcing rods and struts can be added if necessary; the gel coat can be pigmented or painted. Application: Fiberglass, a non load-bearing material attached to a separate structural frame, is frequently used as a replacement where a lightweight element is needed or an inaccessible location makes frequent maintenance of historic materials difficult. Its good molding ability and versatility to represent stone, wood, metal and terra cotta make it an alternative to ornate or carved building elements such as column capitals, bases, spandrel panels, beltcourses, balustrades, window hoods or parapets. Its ability to reproduce bright colors is a great advantage. combustible (fire retardants can be added); fragile to impact. Can original materials be saved/used? Have expansion joints been designed to avoid unsightly appearance? Are there standards for color stability/durability? Have shop drawings been made for each piece? Have samples been matched for color and texture? Do codes restrict use of FRP? Material: Epoxy is a resinous two-part thermosetting material used as a consolidant, an adhesive, a patching compound, and as a molding resin. It can repair damaged material or recreate lost features. The resins which are poured into molds are usually mixed with fillers such as sand, or glass spheres, to lighten the mix and modify their expansion/contraction properties. When mixed with aggregates, such as sand or stone chips, they are often called epoxy concrete or polymer concrete, which is a misnomer as there are no cementitious materials contained within the mix. Epoxies are vapor impermeable, which makes detailing of the new elements extremely important so as to avoid trapping moisture behind the replacement material. It can be used with wood, stone, terra cotta, and various metals. Application: Epoxy is one of the most versatile of the new materials. lt can be used to bind together broken fragments of terra cotta; to build up or infill missing sections of ornamental metal; or to cast missing elements of wooden ornaments. Small cast elements can be attached to existing materials or entire new features can be cast. The resins are poured into molds and due to the rapid setting of the material and the need to avoid cracking, the molded units are generally small or hollow inside. Multiple molds can be combined for larger elements. With special rods, the epoxies can be structurally reinforced. 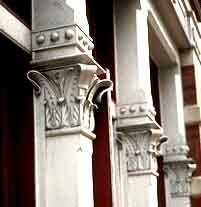 Examples of epoxy replacement pieces include: finials, sculptural details, small column capitals, and medallions. good casting ability; molds can be taken from building material can be sanded and carved. Are historic materials available for molds, or for splicing-in as a repair option? Has the epoxy resin been formulated within the expansion/contraction coefficients of adjacent materials? Have samples been matched for color/finish? Is there a sound substrate of material to avoid deterioration behind new material? Substitute materials—those products used to imitate historic materials—should be used only after all other options for repair and replacement in kind have been ruled out. Because there are so many unknowns regarding the longterm performance of substitute materials, their use should not be considered without a thorough investigation into the proposed materials, the fabricator, the installer, the availability of specifications, and the use of that material in a similar situation in a similar environment. Substitute materials are normally used when the historic materials or craftsmanship are no longer available, if the original materials are of a poor quality or are causing damage to adjacent materials, or if there are specific code requirements that preclude the use of historic materials. Use of these materials should be limited, since replacement of historic materials on a large scale may jeopardize the integrity of a historic resource. Every means of repairing deteriorating historic materials or replacing them with identical materials should be examined before turning to substitute materials. The importance of matching the appearance and physical properties of historic materials and, thus, of finding a successful longterm solution cannot be overstated. The successful solutions illustrated in this Brief were from historic preservation projects involving professional teams of architects, engineers, fabricators, and other specialists. Cost was not necessarily a factor, and all agreed that whenever possible, the historic materials should be used. When substitute materials were selected, the solutions were often expensive and were reached only after careful consideration of all options, and with the assistance of expert professionals. The author gratefully acknowledges the invaluable assistance of coworker Michael Auer in editing this manuscript. The following individuals are to be thanked for their technical assistance: Mary Oehrlein A.I.A., Washington, D.C.; John G. Waite, Albany, NY: Hyman Myers, R.A., Philadelphia, PA, Thomas Fisher, Stamford, CT; Harrison Goodall, Kinnelon, NJ. In addition, the staff of Preservation Assistance Division, the cultural resources staff of the National Park Service Regional Offices, and Stan Graves, on behalf of the National Conference of State Historic Preservation Officers, provided useful comments that were incorporated into the manuscript. Berryman, Nancy D.; Susan M. Tindal, Terra-Cotta; Preservation of an Historic Material. Chicago: Landmarks Preservation Council of Illinois, 1984. Brookes, A.J., Cladding of Buildings. New York: Longman Inc., 1983. Fisher, Thomas, "The Sincerest Form of Flattery," Progressive Architecture (Nov. 1985). Gayle Margot; David W. Look, AIA; John G. Waite, Metals in America's Historic Buildings: Uses and Preservation Treatments. Washington, D.C.: Preservation Assistance Division, National Park Service, U.S. Department of the Interior, 1980. Historic Building Facades. New York: New York Landmarks Conservancy, 1986. Hornbostel, Caleb, Construction Materials: Types, Uses and Applications, New York: John Wiley and Sons, Inc., 1978. Lynch, Michael F; William J. Higgins, The Maintenance and Repair of Architectural Sandstone, New York Landmarks Conservancy, 1982. National Park Service, Rocky Mountain Regional Office, Preservation Briefs 12: The Preservation of Historic Pigmented Structural Glass. Washington, D.C.: Preservation Assistance Division, National Park Service, U.S. Department of the Interior, 1984. Phillips, Morgan and Judith Selwyn, Epoxies for Wood Repairs in Historic Buildings. Washington, D.C.: Preservation Assistance Division, National Park Service, U.S. Department of the Interior, 1978. Phillips, Morgan W., The Morse-Libby Mansion: A Report on Restoration Work. Washington, D.C.: Preservation Assistance Division, National Park Service, U.S. Department of the Interior, 1977. Tiller, deTeel Patterson, Preservation Briefs 7: The Preservation of Historic Glazed Architectural Terra-Cotta. Washington, D.C.: Preservation Assistance Division, National Park Service, U.S. Department of the Interior, 1979.